B'Elanna was born in 2349 on the Federation colony Kessik IV to John Torres, a Human father and Miral, a Klingon mother. She spent much of her early life on Kessik IV, but because relations between the Klingon Empire and the Federation were not "too cordial" at that time, B'Elanna and her mother were the only Klingons on the planet. Although none of the other colonists voiced any negative opinions of B'Elanna, she felt that she and her mother were perceived differently; a feeling that made her uneasy and which she found hard to shake. B'Elanna's alienation and the roots of her insecurities had their foundations at an early age in her life where she was teased for her appearance as a result of her Klingon heritage. When she attended grammar school she was tormented by a boy called Daniel Byrd who would point at her cranial ridges and tease her about being half-Klingon, calling her "Miss Turtlehead". This insult angered Torres so much until one day during recess she attacked Byrd while he was on the gyro-swing. Torres disengaged the centrifugal governor, which caused Byrd to spin so fast that he almost flew apart. Torres then yanked Byrd off the swing and "started pounding his little face" until their teacher, Miss Malvin, separated them. The alienation continued when her own father began distancing himself from them. 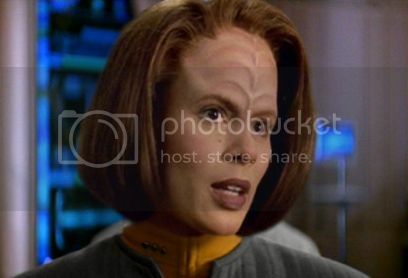 At one time, when B'Elanna was on a camping trip with her father, her uncle Carl and her cousins Elizabeth, Dean, and Michael, she overheard her father complaining about her, likening her moody and angry behavior to that of her mother's, Miral, and that he had a hard time living with two Klingons. John Torres finally left the Federation colony and traveled back to Earth in 2354, when B'Elanna was five years old, never to return to his family again. For months after, B'Elanna cried herself to sleep every night, wondering what had made her father leave and if it was her fault. However, she never talked about her feelings of guilt and shame to anyone and eventually decided for herself that her father had left because she looked and acted Klingon. These kinds of set backs resulted in B'Elanna developing a thick skin, often punching her way through life. She often blamed her Klingon temper having gotten her in trouble all the time. She even attempted to change her appearance to look more Human; an insecurity that remained with her for most of her life, culminating in her trying to genetically alter all of her unborn child's Klingon features when she was pregnant with her daughter in 2377. After her father left, B'Elanna and her mother lived on Qo'noS, the Klingon homeworld, for some time. Eventually her mother pulled B'Elanna out of the Federation school she was attending and took her to a Klingon monastery in order to teach her honor and discipline. However, B'Elanna and her mother, found it difficult to cope without John in their lives. Shortly before Miral returned to Qo'noS, B'Elanna left for Starfleet Academy, where she had a hard time fitting in, often getting into trouble with instructors and faculty. Within two years at the Academy, she was suspended once and had four disciplinary hearings against her. Even though quite a brilliant student and promising engineer, she eventually dropped out of the Academy in 2368, at the age of 19. B'Elanna never spoke to her father again after he had left them in 2354, until he initiated contact with her in 2377, after she had been stranded for nearly seven years in the Delta Quadrant. John tried to make amends and even though it was not easy for B'Elanna she tried to re-establish a relationship with her father. One of Torres' favorite foods as a child was banana pancakes with maple syrup, which her grandmother would make for her. That beloved meal always put a smile on B'Elanna's face. Her other favorite foods included potato salad with paprika and fried chicken. One time Miral took her to visit the Sea of Gatan, where she almost drowned. After her mother resuscitated her, she told B'Elanna about the Klingon beliefs of the afterlife, Sto-vo-kor, and Gre'thor. Beginning in 2366, Torres attended Starfleet Academy where she participated on the Academy decathlon team. During her time in the Academy, she had four disciplinary hearings and one suspension. She also had to dodge several punches in the lab, which Chakotay later joked about, saying, "Only you, B'Elanna, could start a brawl in Astrotheory 101." During her time at the Academy, B'Elanna dated Maxwell Burke, however, their relationship did not last long. After a brilliant but troubled two years headed toward an engineering specialty, she dropped out at age 19. Her teachers included Commander Zakarian and Professor Chapman. Torres and Chapman argued constantly, so she was later surprised to learn that Chapman thought she was one of the finest students he had ever taught and was disappointed when she dropped out. He had placed a note in her permanent record saying he would support her if she ever reapplied. After leaving the Academy, an angry young Torres eventually joined the Maquis in 2370, after former Starfleet officer Chakotay saved her life. From then on she formed a close friendship with Chakotay and she became one of his most trusted friends. At that point in her life, the Maquis became the closest thing to family she had ever had. Fighting Cardassians gave her the outlet she needed in dealing with her violent emotions. To help deal with her explosive and often violent temper, Chakotay taught her many Native American and spiritual techniques to help calm her emotions; he even trained her to speak to her "animal guide". To his surprise, she became the only person he'd ever known who tried to kill their animal guide. Torres also formed a close friendship with Seska, a Bajoran crew member in Chakotay's Maquis cell. She considered Seska to be her best friend, long before finding out that Seska was really a Cardassian agent of the Obsidian Order. The first time Torres took a leadership role in the Maquis, she led her people into a cave that she thought was a Cardassian Military installation, but she mistook unstable mineral deposits for weapons signatures. There was a rock slide and she and her team was stuck there for three days. They finally dug themselves out with their bare hands before being rescued. In late 2370, the Cardassians deployed a sophisticated automated missile called the "ATR-4107" to destroy a Maquis munitions base. However, the missile failed to detonate and Torres, who nicknamed it Dreadnought, managed to board the weapon, spending nearly a month to completely reprogram the computer to work for the Maquis and changing its vocal subroutines so that the computer sounded like her. Without authorization from Chakotay, she sent Dreadnought to attack the Cardassian fuel station on Aschelan V, but an evasive attack route took it through the Badlands, where it inexplicably disappeared. Two years later, Torres eventually found out that, like Voyager, the missile had been brought to the Delta Quadrant by the Caretaker entity. In 2371, when their ship, the Val Jean, was being chased into the Badlands by Gul Evek's flagship, the Vetar, it was mysteriously transported to the Delta Quadrant by the Caretaker. After the crew was subjected to a painful examination, the crews of Voyager and the Maquis vessel were returned to their ships, with the exception of Torres and Starfleet ensign Harry Kim. Those two were sent by the Caretaker to an Ocampan settlement beneath the surface of a planet, where they were told that they were dying and needed medical care. Torres refused to cooperate and attempted to escape. Both Torres and Kim were rescued by the crews of Voyager and the Maquis. The Val Jean was later destroyed, and its crew, including Torres, joined the Federation starship USS Voyager. Since the two crews were stranded together in the Delta Quadrant, they were forced to work together as a single crew. Torres was initially assigned the provisional rank of lieutenant junior grade. Torres had difficulty getting along with the temporary chief engineer, Joe Carey, to the point of breaking his nose over plasma conduits. She was recommended as a replacement chief engineer by Chakotay. However, Kathryn Janeway opposed this decision. After Voyager became trapped in a quantum singularity, Torres proved her skills to Janeway and earned her respect. Janeway then made her chief engineer over Carey. While exploring a nebula, Torres discovered that it was actually a living creature and that by entering the cloud-like being, Voyager had wounded it. Torres modified a nucleogenic beam and was able to heal the wounded creature. While visiting the Sikarians, she learned that they possessed the ability to fold space and travel great distances. This would have greatly reduced the length of Voyager's journey, but the aliens refused to share their technology because of their prime directive. She wanted to steal the technology or make an illegal trade for it, but Janeway ordered her not to do so. She ignored Janeway's order and arranged a meeting with one of the aliens. She was shocked when Tuvok assisted her, but the technology was not compatible with Voyager. Later that same year, Torres was captured by Vidiians, who experimented on her. A Vidiian named Sulan, who had learned that Klingon DNA was resistant to the Phage, separated Torres' Klingon and Human DNA, creating two separate individuals, one of each species. The Klingon Torres gave her life to save the Human Torres and, once aboard Voyager, The Doctor was able to recombine both elements of Torres' DNA. The following year she was imprisoned by the Mokra Order while trying to secure tellerium. She was subsequently rescued by Janeway. Torres was also kidnapped by automated personnel units created by an extinct race to fight their wars. The units wanted Torres to help create new units because they had been unable to stabilize their power units. Torres was able to create a prototype from which they could create more units but she learned that their former creators had called off the war and the units refused to stop fighting, killing their creators in the process. As different units arrived from the other side of the war, a battle ensued. The new prototype that Torres had created would have allowed the Pralor robots to win the war against the Cravic robots. Torres destroyed the prototype and was beamed aboard Voyager while the units continued their civil war. Later, Voyager encountered the Cardassian automated missile called Dreadnought that Torres had reprogrammed while she was still in the Maquis. They found that it had been brought into the Delta Quadrant by the Caretaker and was headed towards the inhabited planet Rakosa V, which it thought to be Aschelan V, the site of a Cardassian fuel depot. Torres was able to beam aboard it and, with some difficulty, destroy the missile. At first she refused to let The Doctor harvest some of her brain tissue to find a cure for the Phage when Danara Pel, a Vidiian scientist for whom The Doctor developed romantic feelings, was beamed aboard Voyager. Klingon DNA was resistant to the Phage and The Doctor believed this was the only way to help Pel. She later consented and it helped The Doctor retard the Phage in Pel. Torres and Kim had their consciousnesses captured in a Kohl hibernation status control by an evil entity known as The Clown. She was released to inform Janeway that if they tried to disable the program, the Clown would kill the Kohl captives and Kim. During a physical encounter with the Kazon she accidentally projected The Doctor into outer space. While stranded on a hostile planet when the Kazon took over Voyager, she helped rescue Neelix and Kes from a primitive tribe on the planet. In another encounter, Torres and Paris were attacked by unknown aliens. She was able to recover and get Paris back to Voyager for medical care. While Voyager was transporting a group of Enarans, Torres began having dreams of genocide against members of their race known as "the Regressives". In her dreams, Torres was reliving the experiences of an Enaran named Jora Mirell. The real Mirell was transmitting her memories to Torres. After Mirell died, Torres confronted the Enarans who denied any knowledge of the event; they left, but not before Torres was able to transfer the memories to another Enaran. Later that year, Torres was affected by the pon farr when Vorik, a Vulcan crewmate, tried to mate with her. This spurred her Klingon mating instincts which caused many problems. This also led to the first obvious hints of a relationship with Tom Paris. While under the influence of the pon farr, Torres and Paris shared a passionate kiss and intimate revelations about their feelings toward each other. But after fighting with Vorik in the ritual challenge which purged her of the fever, she only vaguely acknowledged what happened. Torres reprogrammed The Doctor's perfect holo-family into a more realistic example of family life, which caused him distress but ultimately gave him a better understanding of family life and its problems. She helped end the crew's imprisonment by the Nyrians when the crew was imprisoned on a bio-sphere ship. Torres reconfigured The Doctor's optical sensors so that he could detect passages that led to different biospheres. This enabled them to access a translocation system that allowed the crew to escape. She also took part in a holoprogram about a mutiny on Voyager that Tuvok had programmed as a training exercise for his security detail. The program turned deadly after being tampered with by Seska when she had been on the ship two years earlier. Torres had difficulty controlling her anger. She verbally attacked Seven finding it hard to believe she had no "sense of guilt" for her past as a Borg. While trying to modify the warp core, it became critical and had to be dumped. Paris and Torres left in a shuttle to retrieve it. Upon finding it, they discovered a Caatati trying to salvage it and, after a brief fight, the shuttle was destroyed with the two left in space in their spacesuits. As their air dwindled, Torres was forced to confront her true feelings and told Paris she loved him, just as Voyager, which retrieved the core from the Caatati, arrived to rescue them. She accompanied The Doctor on an away mission to save an another sentient hologram stranded on a disabled ship. Torres discovered that the hologram had killed the organics on the ship, and had gone mad. She was able to deactivate him before he killed her. Torres was used as a pawn in an illegal trade of violent thoughts on the planet Mari. She was imprisoned for transferring violent thought to the citizens, but Tuvok proved her innocence. During the Hirogen takeover of Voyager, when they used the crew in various hunting scenarios, she was a pregnant resistance fighter carrying the baby of one of the German officers who had taken advantage of her. After examining a substance she had discovered on a toxic planet, Torres found that the substance was sentient and could duplicate lifeforms. She was one of the crew who allowed her DNA to be duplicated by the aliens so that they could experience consciousness. Torres battled an alien space craft with a bio-neural interface in order to save Paris. Alice attempted to kill Torres by sealing a hatch in the shuttle and shutting off life support systems. Paris saved her. She fought the Vaadwaur, who, after reviving from stasis, tried to capture Voyager. Torres crashed on a planet where, in exchange for parts to repair the shuttle, she told Kelis, a poet, stories he later used to amuse the head of his planet. In 2375, Voyager, using a Hirogen communication system, made contact with Starfleet. Torres was in an accident and when in a coma she found herself in Klingon Hell, Gre'thor. There she met her mother, Miral, who told her that Torres' rejection of Klingon ways had doomed them both. When Torres woke up, she asked to be put into a coma again so she could save her mother. The Doctor did as she asked. Her mother is saved not by Torres dying for her or by performing Klingon rituals, but rather by Torres living a good life and being true to herself. Torres became extremely depressed when she learned that most of her Maquis friends had been killed by the Dominion. She began taking unnecessary risks, such as using the holodeck with its safety protocols turned off. Along with Paris and Kim, she launched a new shuttle called the Delta Flyer in which they encountered the Malon species. During a battle with them, she devised a way to contain a gas leak and save the crew and the shuttle. This made Torres feel needed again, and her depression subsided. Seven recommended Torres to help him study for the warp mechanics section in the Starfleet Academy entrance exam. She wed Paris after an interstellar starship race that Irina, one of the participants, tried to sabotage and thereby destroy the peace in the area. She had joined Paris in the race because she wished to share his interests. A bomb was planted on their ship, but they were able to eject it in time. They married after the race. After holograms used by the Hirogen became self-aware, they rebelled and killed many Hirogen. The holograms were led by Iden, who believed that all organics should be destroyed. After their holoprograms became unstable during a battle with the Hirogen and Voyager, Torres, an expert on holo-emitters, was kidnapped. At first believing that they only wanted to be left alone, Torres helped enhance their technology. Once she realized that Iden was bent on destroying organics, she stopped him with the aid of The Doctor. Torres asked Janeway to let the other holograms go and Janeway agreed. She again confronted her Klingon side when she became pregnant. She was afraid to have a baby because she thought that the baby would suffer as she had during her childhood. She found out that the child had a deformed spine that The Doctor could correct genetically in the womb. When she saw a projection of the child and discovered it had Klingon ridges, she questioned whether she wanted the child. She asked The Doctor to make further genetic changes so that the child would not have Klingon features. She falsely altered a diagnostic test that convinced The Doctor that the changes were necessary. Paris found out about the false report and stopped The Doctor from performing the procedure. He discovered that she blamed herself for her father having left her because she was Klingon. Paris convinced her that he would never do that and wanted a child just like her. She believed him and accepted the pregnancy. Voyager encountered a Klingon generational ship. They were on a quest to find the savior of the Klingon race, the kuvah'magh. The captain of the Klingon ship, Kohlar, believed her child to be the kuvah'magh. They initiated the self-destruct sequence which in turn caused a warp core breach and Janeway transported their entire crew on board to save them. Kohlar wanted Torres to help him convince his crew that her child really was their savior. When she was insulted by a Klingon warrior, Tom Paris accepted a challenge from him to defend her honor. The warrior collapsed in the battle and The Doctor discovered the Nehret, a fatal disease, caused the collapse. Because the Nehret is only contagious to Klingons, she and the baby became infected. Because of this Kohlar's group no longer believed the child could be their savior and they tried to take over Voyager, but failed. The Doctor discovered a cure to the Nehret using the baby's immune system. The Klingons finally came to believe that the baby was their savior and Janeway dropped them off on an uninhabited M-class planet. Torres and Paris considered the name Kuvah'Magh for their baby. Torres built a polaron modulator that helped Voyager escape a void in space that trapped ships. During the final battle with the Borg which led to Voyager's return home, Torres gave birth to her daughter Miral. Upon return to the Alpha Quadrant, Torres was promoted to Lieutenant Commander. She then went to the planet Boreth to find her mother, Miral. She eventually found her, and the two began rapprochement, when Miral was mortally wounded by a wild animal. This animal was the mother of a younger animal B'Elanna had hunted for food. The mother had stalked B'Elanna for some time until it eventually attacked the two women. After killing the animal, Miral then asked her daughter to perform the hegh'bat. Knowing that the only other outcome was her mother suffering a slow, painful death, a heartbroken B'Elanna carried out her wishes. After reuniting with her husband and daughter, the family moved to Boreth to pursue prophecies about the infant. At last report, B'Elanna had made what she considered a significant discovery in the scrolls and received a warning of a threat against Miral's life. B'Elanna was talked into returning back to Starfleet in late 2379 to be the fleet chief engineer for Project Full Circle where she and Miral would be able to live on Voyager with her husband.